Over the course of Lernabit, people have written to me and said that they like the concept of learning new things by teaching others. But as I spoke to more people, I noticed a few common objections that would keep coming up again. For example, some people said they liked the idea of learning through audio, but said they didn't want to make their lectures publicly available to everyone else. Others told me that they like the concept of learning by teaching others, but weren't thrilled about creating audio lectures to do it. Today, I'm excited to announce a new feature on Lernabit called Notes, which clears up those problems and just about all of the other common complaints. So what are Notes exactly? Previously, Lernabit was comprised entirely of audio lectures called "Bits". You would use the app to create an audio lecture for others. By doing so, you would improve your own understanding of the subject while creating free educational content for others. I like to think of Notes as basically being Bits 2.0, because Notes can do all of that and a lot more. 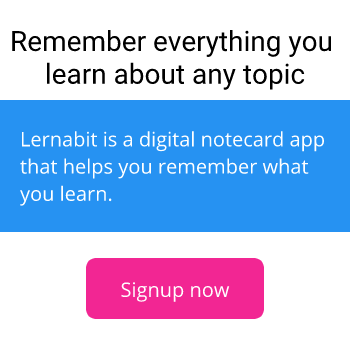 Notes allow you to create notes about new things you learn, and Lernabit will remind you when it is time to review it. Your notes can be in audio or text format, with more formats coming soon. In addition, Notes can be public or private. So if you want to create public audio lectures for others to learn from, you can still do that with Notes. The difference is that Bits required you to do that, while Notes just makes that an option. Because Notes can do everything Bits could do and so much more, Bits have gone away completely and all existing content has been converted to Notes. That eliminates redundant features and avoids any confusion between the two features. In addition, "Notes" is a more intuitive name for new visitors than "Bits". It is a lot more obvious what the feature does. Along with the added ability to write notes in text-only format, Notes have some other cool capabilities. The real magic happens when the One Click Remember feature comes into the picture. As you browse public notes from other people, there is a button that allows you to remember it with one click. Just click that button, and that note will be added to your review schedule. When you find a cool Note, you can remember it forever with one click. Notes support the use of hashtags to categorize your notes and easily explore related topics. The search feature has full support for the new privacy settings. When you enter a search, it will check if you are logged in and automatically include your own private notes in the search results along with public content from others. One search will show you whatever is most relevant, whether it was created by you or someone else. There are a lot of benefits to taking notes in small chunks. For example, research has found that when you shuffle your content before reviewing it, you are more likely to remember it. Notes makes that easier to do by being optimized for quickly taking many small notes in rapid succession, as you might do while watching a lecture. These optimizations include preserving information that is likely to stay the same. For instance, Notes taken in rapid succession at a lecture will likely all be given the same privacy setting, so that form option will stay the same so you don't have to keep manually selecting that option. Just write your note, throw in some hashtags, and submit it. The form will clear itself and get ready for the next note. While the Note form is optimized for many small notes, not everybody likes to study that way. If you prefer a longer, in-depth explanation, you can do that too. Notes can be quite long-- up to 10,000 characters in length. As a comparison, this blog post up to this point is about 4,000 characters. Even at that character limit, you can also attach an audio file to it for even more information.